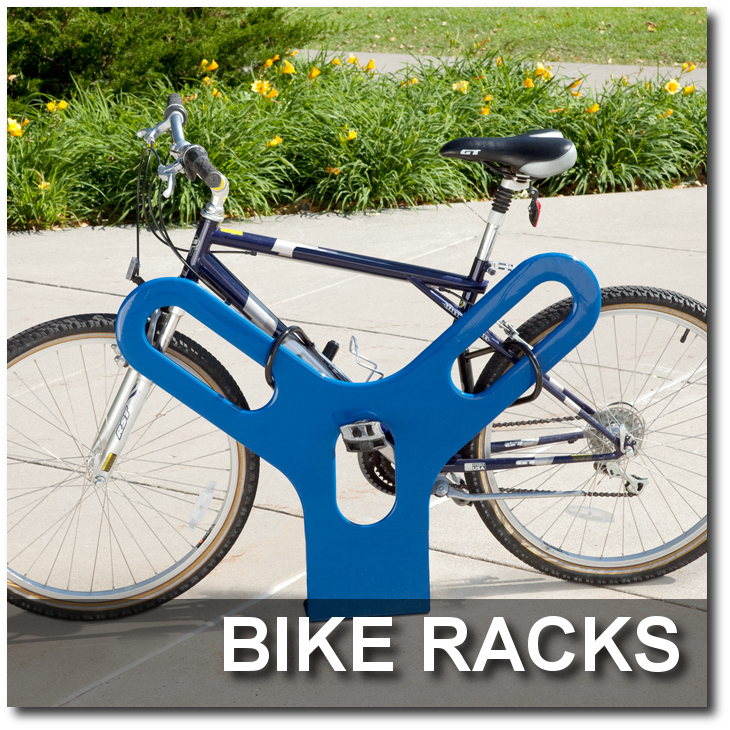 This 18-Bike Double-Sided Grid Bike Rack are perfect for shopping malls, schools and retail centers. Constructed from heavy-duty steel that can withstand hard & contant use. Surface Mount or InGround Mounting options available. 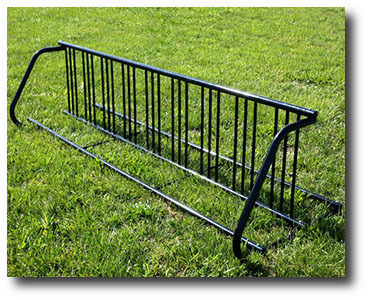 Quick-Ship stock colors are Black & Galvanized. 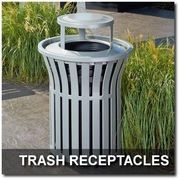 This Accent Collection 5 Gallon Open Top Trash Receptacle with Satin Stainless Steel Finish will compliment any upscale decor. 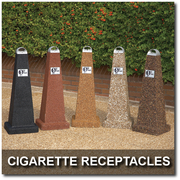 The Ash/Trash Sand Urn Top is available at no additional charge for areas where dual purpose cigarette disposal is required. Recommended for indoor use. 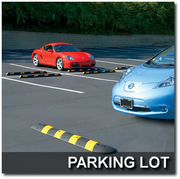 Equipped with a fire-safe, galvanized steel liner that makes maintenance easy. Ships fully assembled & ready for use. 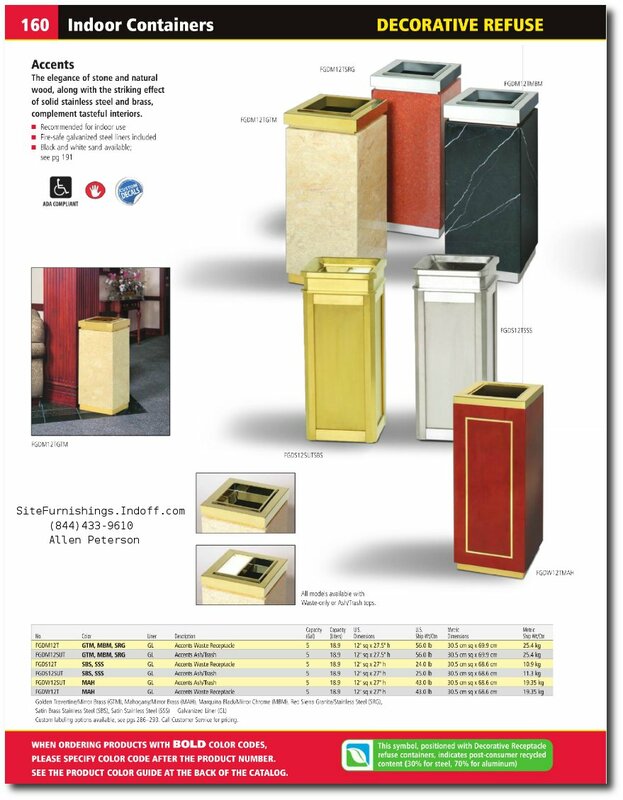 This Accents Collection Marble 5 Gallon Open Top Trash Receptacle features an elegant marble finish available in 3 distinctive colors schemes. 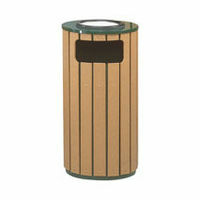 The Ash/Trash Top is also available at no additional charge for areas where dual purpose cigarette disposal is required. Recommended for indoor use. Fire-safe galvanized steel liner included. Shipped fully assembled & ready for use. This Regent Series 40 Gallon Wood Finished Outdoor Trash Receptacle features a beautiful Green Trim with Perma Wood Slats to create a natural appearance. Large 15"Wide x 5.5" High disposal opening. Top removes for easy emptying of inner liner. 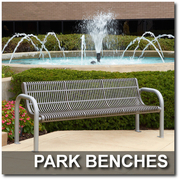 Heavy duty hot dipped galvanized steel construction withstands years of exposure to the elements. The Germ-Fighter liner controls odors and many germs that are harmful to humans. Perma-wood slats are made of 100% recycled polyethylene. This Regent Series 40 Gallon Plastic Lumber Trash Receptacle with Sand Urn Top features Green Trim with Perma-Wood Slats that offer the look & feel of real wood. Large 15" Wide x 5.5" High disposal opening. Removable Sand Urn top allows easy asccess for emptying. 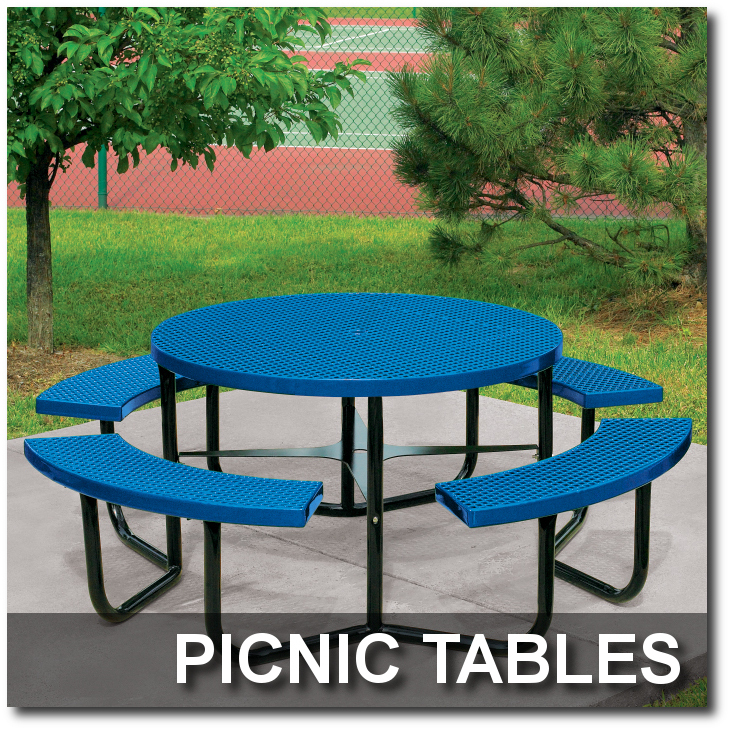 Heavy duty hot dipped galvanized steel construction withstands years of exposure to the elements. Leak-proof rigid plastic liner. Perma-Wood slats are made of 100% recycled polyethylene. 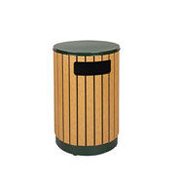 This Regent Series 22 Gallon Open Top Plastic Lumber Trash Receptacle features a 5.5" dia. 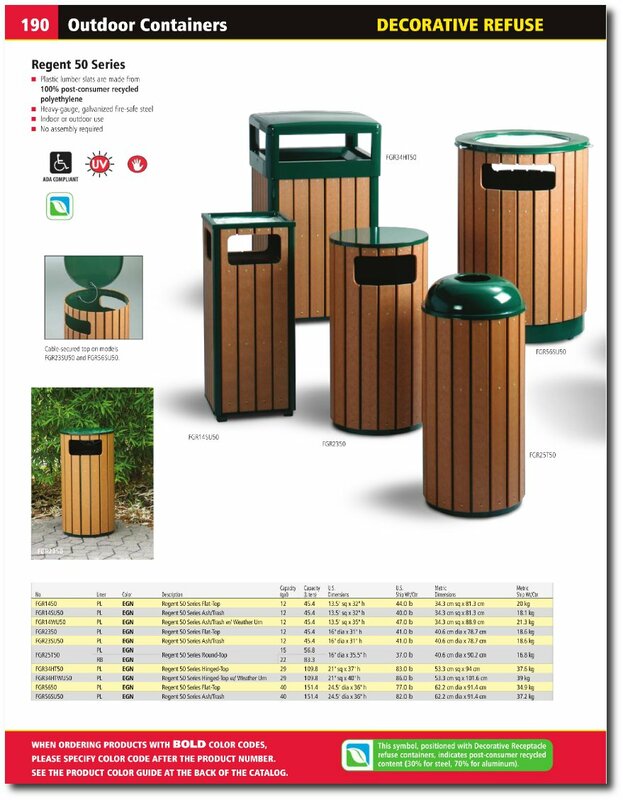 disposal trash opening that conceals contents from view & prevents items from being placed on top of the receptacle. Heavy duty hot dipped galvanized steel body constructed to with stand years of exposure to the elements. Base price includes built in poly bag steel Retainer Bands to hold poly bags secure and out of sight. Optional Plastic Liner available - converts capacity to 15 gallon capacity (up-charge applies). Fade and corrosion resistant. Perma-Wood slats are made of 100% recycled polyethylene. 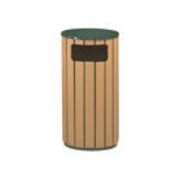 This Regent Series 12 Gallon Flat Top Trash Receptacle features plastic lumber slats are made from 100% post-consumer recycled polyethylene. Cable secured top for easy emptying lifts off. Empire Green Enamel w/Cedar plastic lumber slats. Fully assembled. Heavy duty steel construction withstands the elements. Includes rigid plasic liner. Large 10 1/2"W x 4.5"H disposal opening. 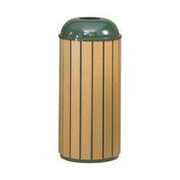 This Regent Series 12 Gallon Outdoor Ash & Trash Receptacle with Sand Urn Top features leak-proof Rigid Plastic Liner. Large 10.5"w x 4.5"h disposal opening. Removable sand urn for easy maintenance. Top removes for easy emptying of inner liner. 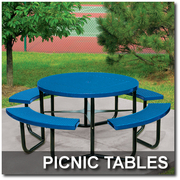 Heavy duty hot dipped galvanized steel construction withstand years of exposure to the elements. 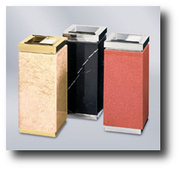 The Germ-Fighter liner controls odors and many germs that are harmful to humans. Perma-Wood slats are made of 100% recycled polyethylene. Shipped fully assembled and ready for use.